My paintings abstract and semiabstract experimental pieces tempered by a decreasing dose of realism. I employ mixed water media (acrylic, inks, papers, plastics, and metal) on paper, canvas, board, wood, tar paper, and linoleum. My colors are bold from an unlimited palette dominated by warmth and influenced by Asian and Latin American themes. Acrylic medium texture is applied by knife, throwing, pouring, and or stamping. I usually start with a rather tight drawing and then edit to revise to a looser painting presentation. I also have a general idea of palette which may change as the painting progresses. My paintings are complex and my intention is to communicate through visual enjoyment. Paintings should instruct but not as with a photograph. I employ collage to explore depth with texture, experimenting with new styles and techniques. As for my overall body of work with respect to themes, techniques, and quantity, new ideas keep my compositions in a state of birth and rebirth. When I paint, I seldom know exactly where the painting is going. My differing styles are not necessarily evolving; what happens in the present is what you see and frequently a surprise. That to me is the mystery of creating. Since retirement as an educator, I have studied with and traveled with artist, M. Douglas Walton in Cambodia, China, Thailand, Indonesia and Mexico. Douglas Walton has had a profound impact on the development of my art. 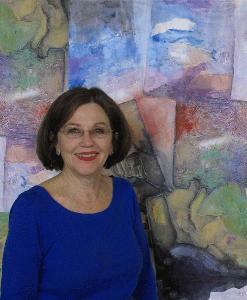 I divide my time between Natchez, and Colorado where I have studied with Oksana Ross, PhD in the area of composition. While in Natchez, I maintain a studio in the Martin Performing Arts Center and I have exhibited in the Mississippi, Louisiana, Colorado and Florida. I am a member of a cooperative gallery, ArtsNatchez, and also exhibit at the Attic Gallery in Vicksburg, MS. I participated in the 12 x 12 Show at the Beca Gallery in New Orleans LA (2009) and exhibited at the Mississippi Museum of Art. Juried shows include "Across the USA," Sanford FL(2010), online Denver Biennial: "Create This", "On Your Own Time" (2011), Denver CO, and The 4th Annual ISAP Online Show (International Society of Acrylic Painters), April 2012.